1. Wash fruit. Slice strawberries into thirds, removing greens. 2. Use a star cutter or just cut honey dew melon into chunks. 3. 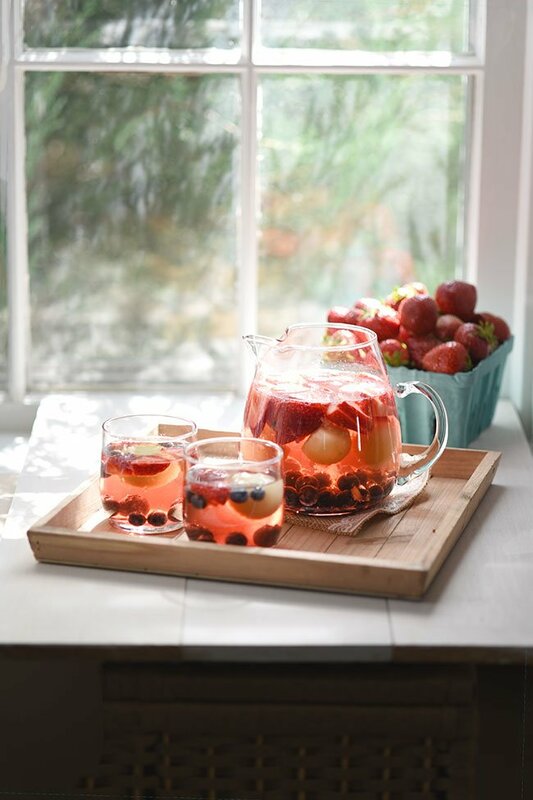 In a 2-liter pitcher, add strawberries, blueberries, honey dew melon then fill with the entire bottle of wine. 4. Gently stir in vodka and juice. 5. Refrigerate, ideally overnight or for at least 2 hours before serving. 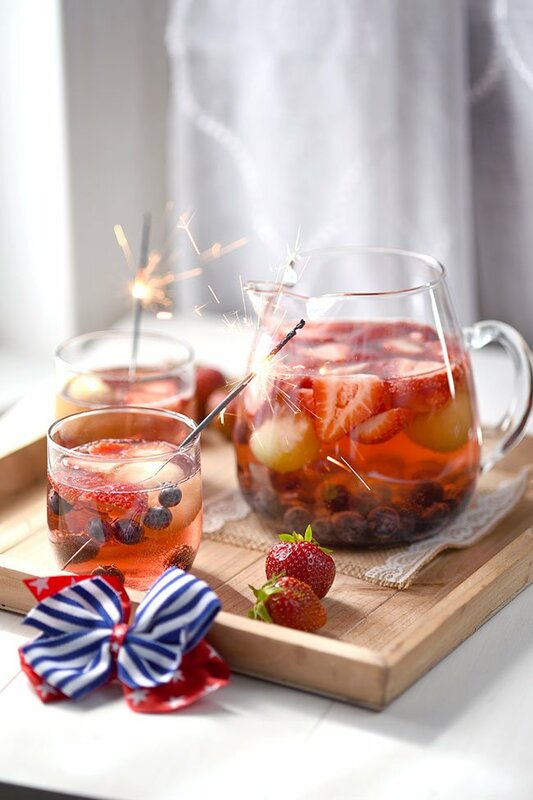 We are in full-swing summer mode over here, prepping early for the 4th of July with this very festive and patriotic red-white-and-blue sangria made with Moscato — a deliciously sweet white wine. Now, you may notice this sangria has a tint of red. Well, that’s because I added a splash of juice. I like to keep things simple and juice is a really easy way to sweeten your sangria while also adding some extra flavor to the mix. I chose to use cranberry juice because that’s what I had, but you could really use any juice OR any carbonated beverage if you like bubbles! I’ve used fresca, seltzer water, white grape juice… you obviously get a different flavor each time, but it’s fun to try something new! So, don’t be afraid to try different combinations here. You can also mix up your fruits. I choose blueberries, strawberries and honey dew melon for the red, white and blue effect. But you could also use pomegranate seeds, cherries, raspberries, etc for the red… black berries for a (dark) blue, and dragon fruit or pineapple for the “white.” Close enough, right? We’re going for the overall Americana vibe here so a little creative liberty is totally acceptable. ? The thing I love about Sangria vs. other cocktails is that you can make a GIANT batch the night before and it’s ready to go for your party, barbecue, get together, ladies night, whatever. It’s great for serving a crowd. I don’t recommend putting it in a decanter because the fruit can clog the spout. I really love how sangria looks in a simple glass pitcher so that’s what I typically opt for. They also make plastic pitchers if you have rowdy guest, ha! 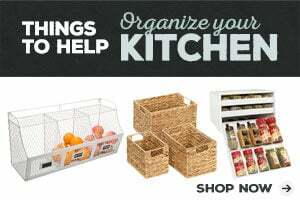 Are you planning a Fourth of July party this year? Check out all the cute red, white and blue party decor on Amazon! You will need a melon baller to get nice round balls of melon or you can simple cut the melon into chunks. If you want to get super fancy, you can use a small star fruit and vegetable cutter to cut your melon chunks into stars. I’m not that motivated ? but I’ve seen it done and it is really cute! This a beverage is for adults 21+. To make virgin, eliminate wine and vodka and just use a combination of juices or try making a batch using kombucha.